OTTAWA - The pace of new home starts picked up in May as the housing sector showed surprising strength Monday, giving economists hope for the second quarter after a slow start to the year. Canada Mortgage and Housing Corp. said housing starts hit a seasonally adjusted rate of 201,705 units in May, up from 183,329 in April. The increase was driven by multiple-unit projects in Ontario, the Atlantic region and Quebec. Royal Bank economist Laura Cooper said the improvement in new home construction along with a stronger pace of sales in the resale market will contribute to an economic recovery in the second quarter. The economy took a hit in the first quarter as it shrunk at an annual rate of 0.6 per cent, due in part to the drop in oil prices. However, economists are looking for it to bounce back in the second quarter. Weak trade numbers for April combined with a strong jobs report for May last week have provided a mixed picture so far. Breaking down the housing starts report, multi-unit starts in urban areas accounted for 122,367 of the total for May, up 16.9 per cent from April, while construction of single-detached houses in urban areas was steady at a seasonally adjusted rate of 58,868 units. There were an estimated 16,470 housing starts in rural areas. 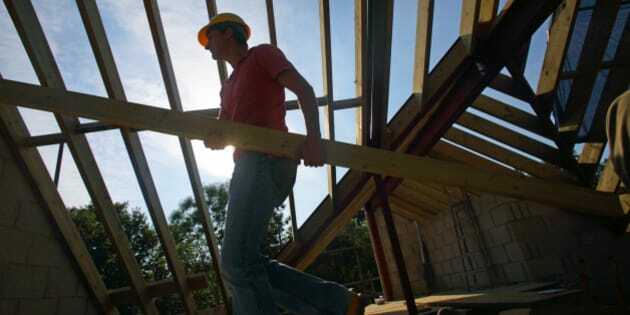 The CMHC report came as Statistics Canada reported that contractors took out $7.8 billion worth of building permits in April, up 11.6 per cent from March. The increase was fuelled in large part by a 30.2 per cent increase in the non-residential sector to $3.3 billion in April, following a 24.8 per cent gain in March. Plans for residential buildings increased 1.2 per cent to $4.5 billion. CIBC economist Nick Exarhos said the report was positive for the economic outlook. "Today's release gives some hope that after investment provided a major drag in the first quarter, there may be reason to believe that things may turn slightly higher in the quarters ahead," he wrote in a note. The growth in residential permits was the third consecutive monthly advance with gains in Ontario, Quebec, Nova Scotia and Newfoundland and Labrador. British Columbia posted the largest decrease. Statistics Canada said the value of single-family home permits rose 6.6 per cent to $2.5 billion in April, the first increase in three months, while plans for multi-family homes fell 4.5 per cent to $2.1 billion.